The central concept guiding the management of parks and wilderness over the past century has been “naturalness”—to a large extent the explicit purpose in establishing these special areas was to keep them in their “natural” state. But what does that mean, particularly as the effects of stressors such as habitat fragmentation, altered disturbance regimes, pollution, invasive species, and climate change become both more pronounced and more pervasive? Beyond Naturalness brings together leading scientists and policymakers to explore the concept of naturalness, its varied meanings, and the extent to which it provides adequate guidance regarding where, when, and how managers should intervene in ecosystem processes to protect park and wilderness values. The main conclusion is the idea that naturalness will continue to provide an important touchstone for protected area conservation, but that more specific goals and objectives are needed to guide stewardship. 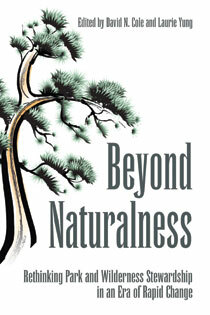 The issues considered in Beyond Naturalness are central not just to conservation of parks, but to many areas of ecological thinking—including the fields of conservation biology and ecological restoration—and represent the cutting edge of discussions of both values and practice in the twenty-first century. This bookoffers excellent writing and focus, along with remarkable clarity of thought on some of the difficult questions being raised in light of new and changing stressors such as global environmental climate change. "[...] So we continue to seek a way forward, and as we do, clear signposts are quite useful. One of these is provided to us in the form of David N. Cole and Laurie Yung's new book, Beyond Naturalness: Rethinking Park and Wilderness Stewardship in an Era of Rapid Change. If Uncommon Ground was the watershed book of the 1990s in North American park conservation, Beyond Naturalness is the game-changer of the first decade of the 21st century. I cannot think of a recent book that has probed so thoroughly and effectively the fundamental dilemmas facing parks and protected areas." "Beyond Naturalness is a commentary on how we can preserve the sense of nature under change. The idea of pristine nature innocent of human presence was, we now know, mythical' but this thoughtful book shows that sound policies can give us a rewarding nature with people in it." "Beyond Naturalness brings together fresh thinking about stewardship of protected areas in the face of pervasive and unprecedented climate change. The authors integrate historical perspectives, ecological theory, and analysis of policies and institutions in defining pathways forward. This volume will be of keen interest to scholars and practitioners." "The management of parks and wilderness will depend on a clear and common understanding of conservation goals for their protection. Particularly relevant in the context of climate change, Beyond Naturalness provides succinct cutting–edge guidance to address pressing challenges in protected-area conservation." "Beyond Naturalness takes parks and wilderness management to a new level of thinking. Far more than a historic and scientific review, it highlights innovative ideas about the future of these critically important lands. This book should be required reading not only for land managers and scientists but for all who care about the future of our precious parks and wilderness areas. " "This book challenges conventional wisdom and explores contradictions in how people view and manage natural parks and wild places...This book is bound to become the reference point for ecosystem management studies." "... Rather than a boilerplate of prescriptions, Beyond naturalness offers managers a toolbox to guide the decision-making process, and compels managers to ask hard questions and articulate their goals and objectives and become much more proactive. ... Overall, Beyond naturalness provides a timely summation and synthesis of current ecological literature and is a valuable contribution for land managers, scholars, and students alike." "Overall, the material in Beyond Naturalness is clearly and compellingly presented...the intent is to provide the fodder for thinking outside the box of traditional park and wilderness stewardship. In that, Beyond Naturalness succeeds admirably." "Based on many years of theory and practice, developed by authors from agencies, non-profit organizations, and academia, and well-referenced for further study, this book is a must-read for any land manager who hopes to succeed in the coming century." "Readers will find this to be a thorough and exceedingly accessible treatment of the background and potential principles to guide protected area management."